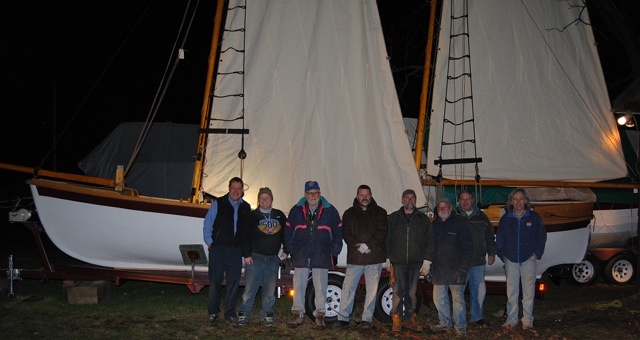 Construction of our newest vessel HMS Lynx began in 2010 in anticipation of the War of 1812 Bicentennial in 2012. 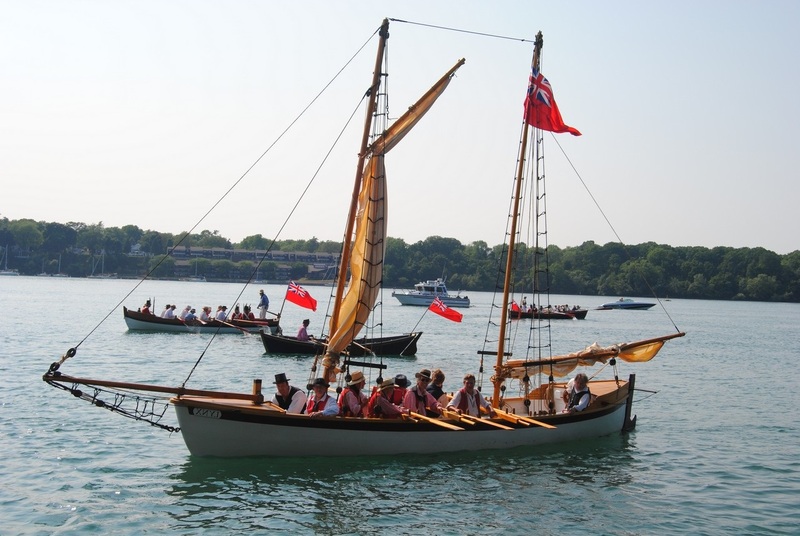 With several ongoing and new events outside of our home port of Penetanguishene, there was demand for a vessel rivaling Badger in size, but with the ability to trailer easily to various Bicentennial events and rig on site without the need of a crane. HMS Lynx is able to raise her two masts with only the coordination of the crew. We tried to make Lynx look as large and intricate as Badger while simultaneously cutting down on her weight and rig time. Lynx`s rig is much different from that of traditional whalers. 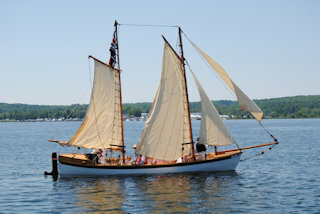 She carries a schooner rig and four sails rather than the original ketch rig with two sails. 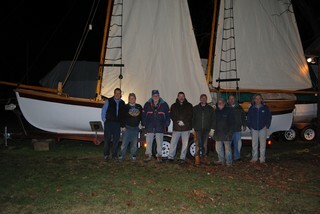 A bowsprit was also added to allow for the two head sails. A raised poop deck was needed to conceal the 9.9 hp outboard motor. Sails were supplied by Kingston sail loft. One of HMS Lynx`s most distinctive details is her wheel. 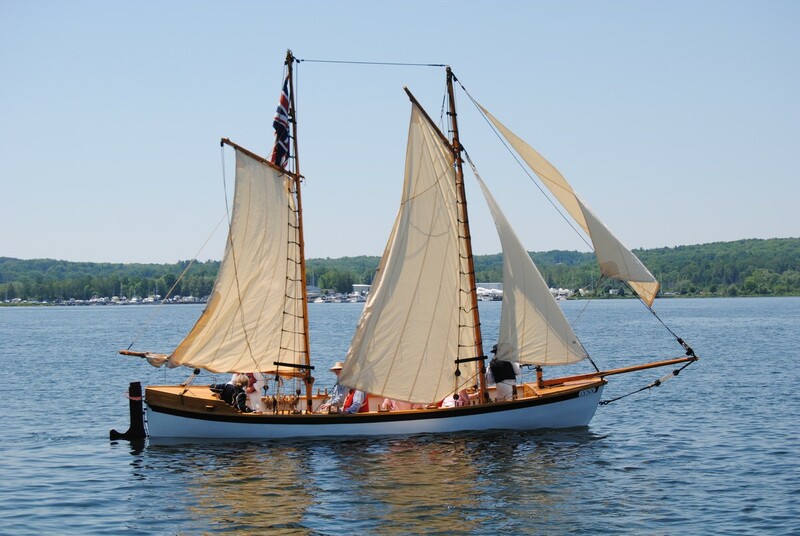 Rather than being fitted with a tiller like our other vessels, Lynx has a hand crafted wheel that is connected to the rudder by traditional means of rope and pulleys.